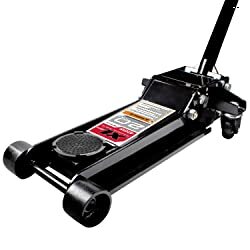 Car jack which is equipped for repair garage, or garage car works to help you raise the car for the replacement of tires or repair some other parts. 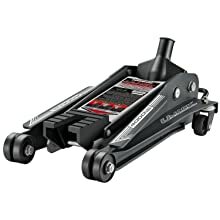 A specific car jack can also allow you to create enough space under the car for checking the car more thoroughly. However, for normal drivers, the vehicle’s undercarriage is often used to lift the tire while your vehicle hits tire malfunction. Hydraulic jacks are devices used to lift heavy loads. Depending on the type of screw or hydraulic cylinder that different force mechanisms are applied, however, they are generally characterized as compact and easy to use. Hydraulic Jacks operation depends on the hydraulic energy generated by the pressure. Connecting two cylinders (one large and one small), then transmitting force through two cylinders creates an extremely large force sufficient to lift heavy loads. 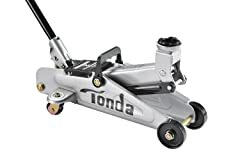 Hydraulic jack lift or Hydraulic jack for lifting efficient car so What are the best hydraulic jacks to buy? 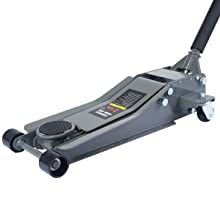 On the market today there are two types of hydraulic jack commonly used is the Vertical Car lift and the Floor Car lift. Vertical-type cars Jacks were popular in the 1900s in the automotive industry. Vertical Car lift is compact, convenient for moving. 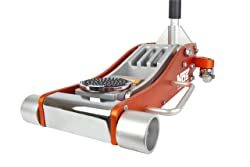 As the name implies, the Vertical Car Jack is just as small as shape of bottle, but the amount of force is sufficient to lift loads from a hundred to several tons. Thanks to that convenience, the bottle size is commonly used on 4-seat cars, used for raising the car. Vertical Car lift is very convenient to change tire to save time and effort. Floor Car lift is not the same as Vertical Car lift in depth of the transmission system, the axis of the jack is horizontal, the thrust. Hoist horizontally. 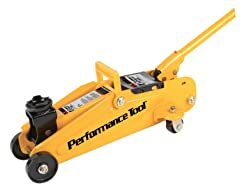 The floor jack can lift the force from 4 to 10 tons. It’s suitable for 7-seats cars or trucks… Most of Mechanic Workshops use this types as it’s safe and perform with high safety rate & durability. 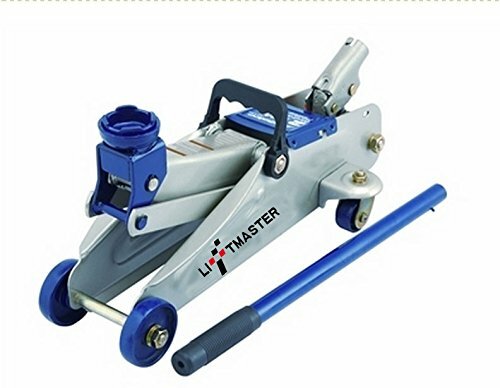 There are also many other types of jacks such as fiber hydraulic jacks, pneumatic presses jacks etc. are divided according to the shape, use and lifting force suitable for each job. 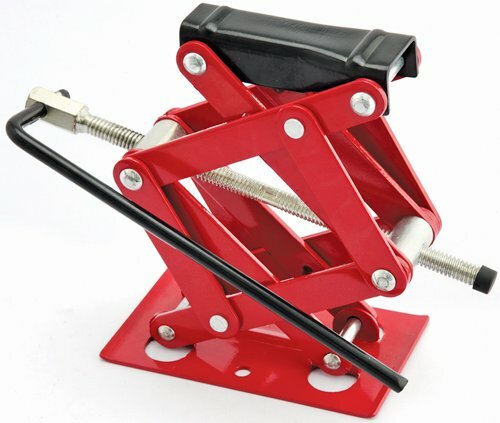 These Car Jack are the best option for you, order the one you like! 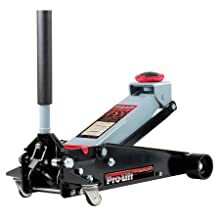 The product can be used as a rugged replacement jack or an extra utility jack that can be stored in the trunk of car due to the compact size. The jack has a lift range from 4-1/8 inches to 15-1/8 inches with an oversized base width of 4-1/2 inches for optimum support. 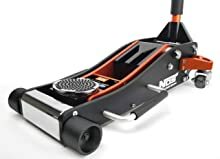 This extra-wide base offers easy positioning and the folding handle delivers on-the-spot quick response and speed when that is needed. 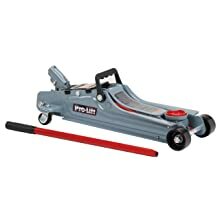 The product is used as a craggy substitution jack or an extra utility jack that can be stored in the trunk of car due to the compact size. The jack has a lift range from 4-1/8 inches to 12-1/4 inches with an oversized base width of 4-1/2 inches for optimum support. The product meets or exceeds ANSI standards. It has been made with a heavy duty steel construction. The user is required to insert the jack handle into the hole of the handle socket. It is also ascertained that the saddle is correctly positioned. To prevent damage, the jack is not required to move while the handle is intact in the socket. To raise load, one hand is to be used to hold the front part of the handle, while other hand would turn slowly at the rear end of the handle clockwise. The product meets ANSI standards. It has been made with a heavy duty steel construction. The user is required to insert the jack handle into the hole of the handle socket. It is also ascertained that the saddle is correctly positioned. To prevent damage, the jack is not required to move while the handle is intact in the socket. To raise load, one hand is to be used to hold the front part of the handle, while other hand would turn slowly at the rear end of the handle clockwise. 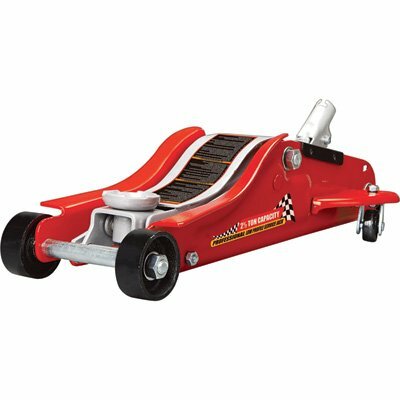 The product has been equipped with large steel casters and swivel casters that facilitate easy maneuverability. The minimum rendered height is 13.5 cm. And the maximum height is 33.5 cm. Comfortable portability is accessed by the lightweight of the product. The accessed welded steel frame construction accumulated with rust resistant finish has been accounted for longer tool life. Such level of construction also provides required solidarity. The product has been manufactured to suit all trades belonging to professional to DIY lovers. The product finds suitability in auto, SUV, truck service, farm, and shop use. Acquired all required certifications. 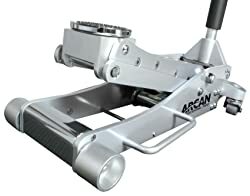 The product is a heavy weight jack that gives the user with better access to low ground clearance vehicle. The jack can be fit under a clearance of 3.5 inches and maneuvered into position quite at ease. The heavy duty steel construction provides the product with the most needed solidarity and long life. This bypass device protects against over pumping. Besides, the built in safety valve provides protection against over loading. The pumping for safe operations is even being protected against exceeding pumping. The suitability of the product also lies with auto, SUV, truck service, farm, and shop use. All required certifications have been acquired. The product has approved capacity of 6000 lbs. The jack is made with light weight aluminum frame. It works in the reduction of product weight and increase portability at the same time. The product is equipped with heavy duty steel lift arm that work in enhancing strength and durability. The quick lifting system works in savoring time. It is also equipped with safety valve that prevents overloading beyond rated capacity. The involved rubber padded saddle protects vehicle frame and there are rubber wheels that swivels for easy positioning. The induction of 360 degree swivel saddle has been useful in making solid load contact. The approved capacity of the product is around 6000 lbs. The jack is made with light weight aluminum frame. It works in the reduction of product weight and increase portability at the same time. The product is equipped with heavy duty steel lift arm that work in enhancing strength and durability. The quick lifting system works in savoring time. Longer life is further accentuated with the induced rust resistant finishes. The equipped safety valve works in preventing overloading beyond capacity. The induction of 360 degree swivel saddle has been useful in making solid load contact. The approved capacity of the product is around 4000 lbs. The jack is made with light weight aluminum frame. It works in the reduction of product weight and increase portability at the same time. The product is equipped with heavy duty steel lift arm that work in enhancing strength and durability. The additional requirement of safety is being provided with the over load bypass valve. This product has been proved great for all cars as well as light duty tracks. Rust resistant finish guarantees longer life. The product has approved capacity of 6000 lbs or 3 tons. The jack is made with light weight aluminum frame. It works in the reduction of product weight and increase portability at the same time. The product is equipped with heavy duty steel lift arm that work in enhancing strength and durability. The quick lifting system works in savoring time. It is also equipped with safety valve that prevents overloading beyond rated capacity. The involved rubber padded saddle protects vehicle frame and there are rubber wheels that swivels for easy positioning. This product has been proved great for all cars like SUV and light duty tracks. Rust resistant finish also ensures longer life. The product has been attributed with a compact design that is accentuated with further versatility of a full sized pack. It involves a dual pump for rapid lifting. Service jack comprises a two piece handle with bumper pad. Construction with top quality heavy duty steel imparts stability and durability. Precise control is made with the involvement of universal joint release. The equipped safety valve prevents overloading beyond rated capacity. The involved rubber padded saddle protects vehicle frame and there are rubber wheels that swivels for easy positioning. Best use of the product is with cars as well as light duty tracks. Rust resistant finish guarantees longer life. The induction of 360 degree swivel saddle has been useful in making solid load contact. The approved capacity of the product is around 4000 lbs. The jack is made with light weight aluminum frame. It works in the reduction of product weight and increase portability at the same time. The product is equipped with heavy duty steel construction engaged in enhancing strength and durability. The additional requirement of safety is being provided with the over load bypass valve. This product has been proved great for all cars as well as light duty tracks. Rust resistant finish guarantees longer life. The product has an approved capacity of 6000 lbs, but it has been made extremely lightweight. This lightweight has been made possible that it can be frequently carried to anywhere liked or so. The reinforced lift arm made from steel has been useful in providing additional strength, chassis torsion control as well as durability. A fast rising action is facilitated with the dual pump pistons. The piston dust shields in preventing hydraulic contamination too. The imbibed bypass and overload valves prevent over-extension of hydraulic ram and jack to be used beyond rated capacity. The suitability of the product also lies with auto, SUV, truck service, farm, and shop use. The product has an approved capacity of 6000 lbs, but it has been made extremely lightweight. This lightweight has been made possible with the use of lightweight alumina. It is also provided that it can be frequently carried to anywhere liked or so. The reinforced lift arm made from steel has been useful in providing additional strength. The additional strength and sturdiness also works in bringing about extended durability. Induction of a two piece handle with bumper pad imparts easy handling capacity. The imbibed bypass and overload valves prevent over-extension of hydraulic ram and jack to be used beyond rated capacity. The induction of safety valve works in preventing overloading. The approved capacity of the product is around 4000 lbs. The jack is made with light weight aluminum frame. It works in the reduction of product weight and increase portability at the same time. The induction of 360 degree swivel saddle has been useful in making solid load contact. The product is equipped with heavy duty steel construction engaged in enhancing strength and durability. The additional requirement of safety is being provided with the over load bypass valve. This product has been proved great for all cars as well as light duty tracks. Rust resistant finish guarantees longer life. The product is best used with cars and light trucks. The product has an approved capacity of 6000 lbs, but it has been made extremely lightweight. This lightweight has been made possible with the use of lightweight alumina. It is also provided that it can be frequently carried to anywhere liked or so. The reinforced lift arm made from steel has been useful in providing additional strength. The additional strength and sturdiness also works in bringing about extended durability. Induction of a two piece handle with bumper pad imparts easy handling capacity. The imbibed bypass and overload valves prevent over-extension of hydraulic ram and jack to be used beyond rated capacity. The product is best suited for cars and light trucks. 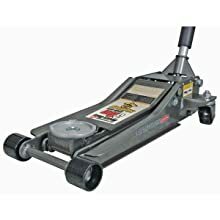 The product has been equipped with large steel casters and swivel casters that facilitate easy maneuverability. The minimum rendered height is 13.5 cm. And the maximum height is 33.5 cm. Comfortable portability is accessed by the lightweight of the product. The accessed welded steel frame construction accumulated with rust resistant finish has been accounted for longer tool life. Such level of construction also provides required solidarity. The product has been manufactured to suit all trades belonging to professional to DIY lovers. The product finds suitability in auto, SUV, truck service, farm, and shop use. All the required certifications have been acquired by this product. 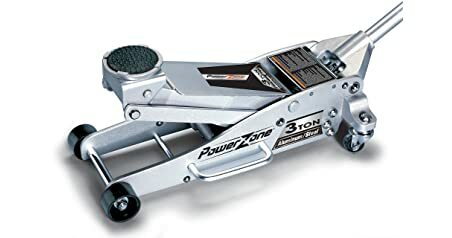 The approved three ton capacity means around 6614 lbs here and the product can be lifted from a mere 2.75 inches to 19.88 inches. The product weighs only 71.7 lbs. The jack is made with light weight aluminum frame. It works in the reduction of product weight and increase portability at the same time. The product has compact volume and the imbibed handle can be taken apart in parts. Thus, the portability feature has been further accentuated. The product gives away spaces too. The built in safety valve can guard overload issues. The lifting is made fast with dual plunger involved with the machine. 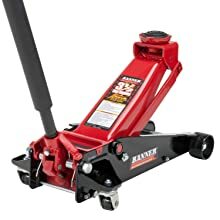 The approved three ton capacity means around 9900 lbs here and the product can be lifted from a mere 2.75 inches to 19.88 inches. The product weighs only 71.7 lbs. The jack is made with light weight aluminum frame. It works in the reduction of product weight and increase portability at the same time. The kit is very simple to be used and easy in practice too. The imbibed rubber saddle protects the vehicle while lifting. 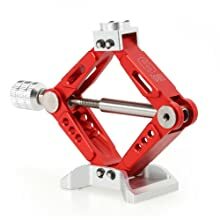 The use of Universal Joint release mechanism provides precision control of load descent irrespective of handle position. There is a magic tool tray with the product that keeps small parts around in convenience. The rolled side frame adds strength in reducing twisting and it belongs to professional grade. The product has been shown great experience with SUVs and all sorts of trucks. The inclusion of a extra long works in savor of time while making the practice of lifting higher vehicles an easy task. The lift ranges between 6 to 21 inches. The approved capacity of the product is around 6000 lbs. The jack is been manufactured from solid steel yet has been light in weight. The light weight works in the reduction of product weight and increase portability at the same time. The induction of 360 degree swivel saddle has been useful in making solid load contact. The product is equipped with heavy duty steel construction engaged in enhancing strength and durability. 1. When the car breaks down, the first thing you need to do is calm down, brake slowly and throw the car to the side of the road in a safe & flat position, enough space to proceed with the tire replacement. Do not stop at cars at place that are not visible for other drivers from long distance. 2. Turn off the machine, pull the parking brake, turn the gear on 1 or P with automatic transmission car, hold the key with you. 3. Turn on the problem indicator light (red button with a large triangle on the dashboard of car) or open the hood to alert other drivers that your vehicle is being repaired. It is recommended to place the repair signage at least 10 meters in a recognizable position on the road. Take the toolbox (the jack, the spanner) and the spare tire from the rear of the vehicle, and check the condition of the equipment. Lock the car in the case of bad guys can take advantage when you are busy manipulating to steal the car. 5. Loosen the screws by loosely cross the screws opposite each other, sequentially in the star shape. Note, this is done before the tire is pulled up, so that when the screws are removed do not slip under the wheel. 6. Tighten the tires in place according to the tire replacement instructions, usually on the jack also with a small guide plate. 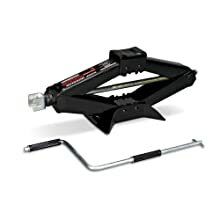 Use Car jack to lift the wheel a little off the ground for changing the tire. Be careful not to scratch your hands when turning the screws.